Research and Scientific studies have been completed on the neurophysiological, psychological, sociological and psychospiritual effects of the Meditation on Twin Hearts. These studies have been conducted in the most part by Glenn Mendoza, M.D. in New York City, New York and by Dr. Vrunda and Supriya Ghorpadkar and Mr. Sundaram in Bangalore, India. Meditation on Twin Hearts showed measureable changes on the pattern of electrical activity through the brain by electroencephalograph (EEG). Comparing EEF studies before and after meditation, there was a dramatic transition from beta waves to alpha waves and delta-theta waves in 14 meditators and non-meditators. There was an observable increase in brain synchrony (alpha-delta-theta waves) between the two hemispheres of the brain after the Meditation on Twin Hearts. There was synchronisation of brain waves initially between the same hemisphere and followed by synchrony between the frontal, middle and rear portions of the brain. A positive relationship of skin conductance before and after the Meditation was observed in all subjects. The Meditation on Twin Hearts was found to show a dramatic muscle potential measurement through electromyogram (EMG) of the scalene and extensor muscles of the arms. There was a significant increase in the neurohormones serum Serotonin and plasma Melatonin (up 300%) following Meditation of Twin Hearts in a pilot study of 17 subjects and a follow-up study of 35 subjects. No Significant relationship between Meditation on Twin Hearts and beta endorphins was noted. 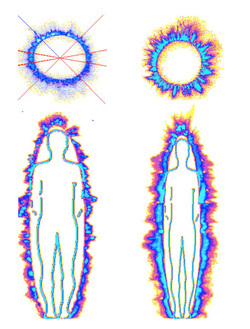 Kirlian imagery of the energy field surrounding the finger(top) and whole physical body(bottom) of a person before(left) and after(right) practising Twin Hearts Meditation, showing the aura becomes bigger and brighter from practising this mediation technique. Dr. Masaru Emoto is an internationally known scientist of water. 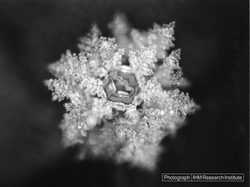 His Japanese laboratory examined frozen water crystals under a microscope, which are then photographed with special equipment. In April 2005, during a Pranic Healing Course participants conducted the Twin Heart Meditation. In this meditation, glasses of water Tokyo tap water were energised. 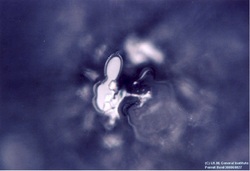 Later, these samples were tested in the laboratory of Dr. Masaru Emoto in Japan. 70% of our body is water. If you regualarly practise this meditation, the quality of the liquid crystalline structure in the your physical body will change. The inner harmony, peace, inner beauty and inner healing that radiates from this meditation technique is clear visiable in the water crystal. If a large number of people practise this meditation on a regular basis, the transformation of our planet is accelerated. That is the message of this experiment.